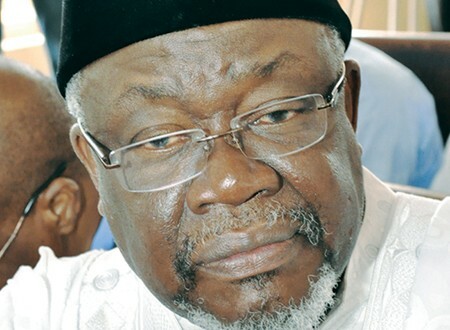 A former chieftain of the All Progressives Congress, Chief Tom Ikimi, on Thursday said that he dumped the party for the Peoples Democratic Party to earn his respect. Chief Ikimi, who disclosed this in Benin City, the Edo State capital when he was received by the leadership of the PDP at the secretariat of the party, also noted that he had implicit confidence in the Chairman, Board of Trustees of the PDP, Chief Tony Anenih, adding that, “we shall have a common agenda of working for the party in Edo state and Nigeria in general”. He insisted that he was not leaving the APC for the PDP to vie for any elective political office, stressing that, “I left the APC for the PDP where I shall be given my respects and my personal dignity respected”. The former Minister of Foreign Affairs also stated that he had consulted with his family and the National Executive Committee of the PDP before joining the party. Ikimi said, “I come here today not as a new member. I come here to be fully identified with my groups of 1999 and 2003. “In politics, the party is supreme. We came here as cooks to cook the food and share it to others. But those who came in took the food away, the plates, the pots and everything away and left the cooks with nothing. “The PDP will take over the state once again and once beaten, twice shy. I am not interested in being in a party of enemies, where a party man will plot against the party; I am at peace with all the leaders of the PDP whether big or small. “I have implicit confidence in Chief Tony Anenih and we have had several meetings and I believe we have bridged the gaps. We shall have common agenda in working for the party in the state and Nigeria”. Ikimi described the APC as his baby, adding that what was achieved in Igueben, his hometown, was done by the federal government and not state government. Earlier, the Edo State Chairman of the PDP, Chief Dan Orbih, described the membership of the former APC chieftain as a significant boost to the party, adding that Ikimi was a “prophet” who had honour in his home. “Your joining the PDP is a plus for the party and a minus to the APC. As we begin to move towards the next election and, although it is said that a prophet has no honour in his home, you are the prophet who has honour at home”, he said.